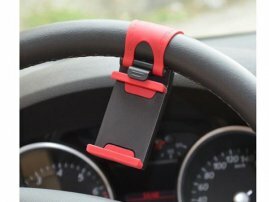 Universal Car Steering Wheel Mount / Holder for iPhone / Samsung Galaxy / Android Smartphones : allputer.com - Accessories for all your Portable Electronics & Computers! - Elastic fixation design: with elastic fixation rubber band, the size of steer wheel won't effect the installation. - Easy installation: Need no extra toos, just a few seconds to get it installed. - Protection: the holder is embedded with soft silicone pad, which protect your phone from scratching or crash. - Please concentrate on driving when you are on the go, don't use your smartphone while driving.